Pocket scrapbooking cards for your everyday life. 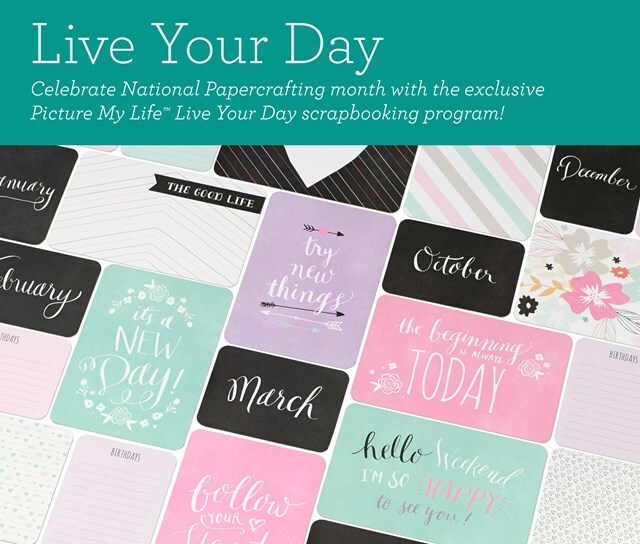 Celebrate National Papercrafting Month with the exclusive Picture My LifeTM Live Your Day scrapbooking program—available for one month only! This collection was designed to coordinate perfectly with the sensational Everyday LifeTM 2016 Planner Pages and My Crush® Everyday Life Pages, so you can seamlessly integrate pocket scrapbooking into your 2016 planner. Whether in the planner or on their own, these cards make it easy to preserve your everyday moments all year long. Get yours today for only $8.95 before this offer is gone! *Offer valid January 1, 2016 (9:00 am MST)–January 31, 2016 (11:59 pm MST) while supplies last. Shipping/handling is calculated based on the full retail price of items.